It's been a while since I've redesigned the site, but uni has been pretty busy. However, it's a lot more than just cosmetics - the site is now fully converted to a WordPress site - I hear you ask, why WordPress? That's another blog post. In short, for me it makes a lot of sense going forward: there was a lot of content wrapped up in lots of custom code and it was a bit unmanageable and difficult to update. A lot of the content remains the same, you can't improve on perfection... In seriousness, this was probably the most boring part of making the new site: transferring all the old content into WordPress. To improve the SEO this meant renaming a load of files, adding alt tags and lots of copying and pasting. 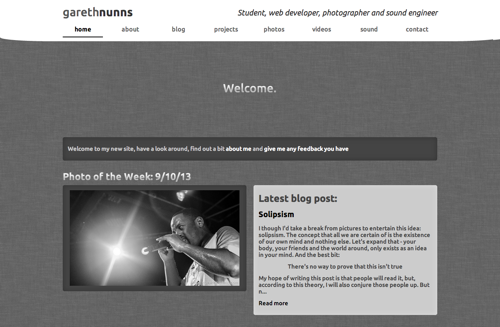 However, now I've done it, it means it will be much easier to change the look of the site, as well as how it works. There are still a few bits of pretty old content if you go back far enough on the blog, but hopefully nothing too embarrassing. Will it get updated more often?